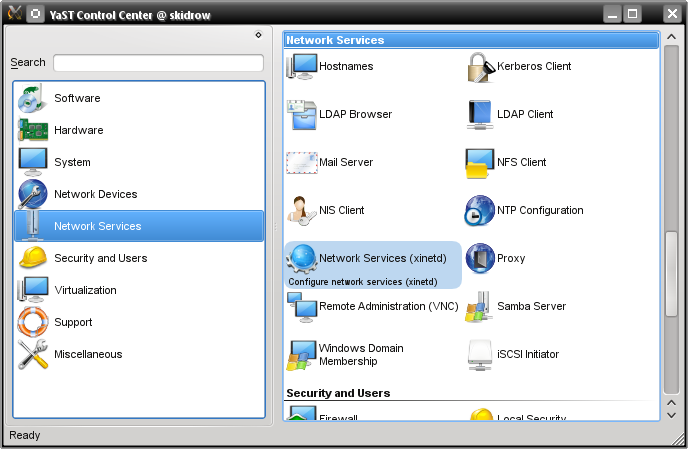 This article will show you how to network openSUSE 11.2 with Windows XP and Windows 7. It is assumed that you are using the openSUSE default desktop, KDE4 (you'll need Samba client/server installed). Any Windows 7 machines should NOT be using the HomeGroup option but instead use the advanced sharing option. To make it easier on you this is a one page article, heavy on the screenshots. It is specifically created for the average user and thus relies on the GUI configuration options when possible. It is my hope you find this article useful. 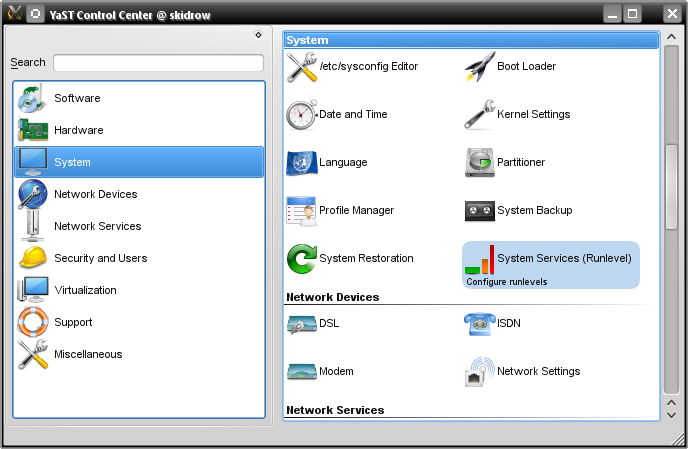 From your Suse box, open YaST (type in Root password). Find the swat service, highlight, and click the Toggle Status (On or Off) button to toggle on. Then click Finish. 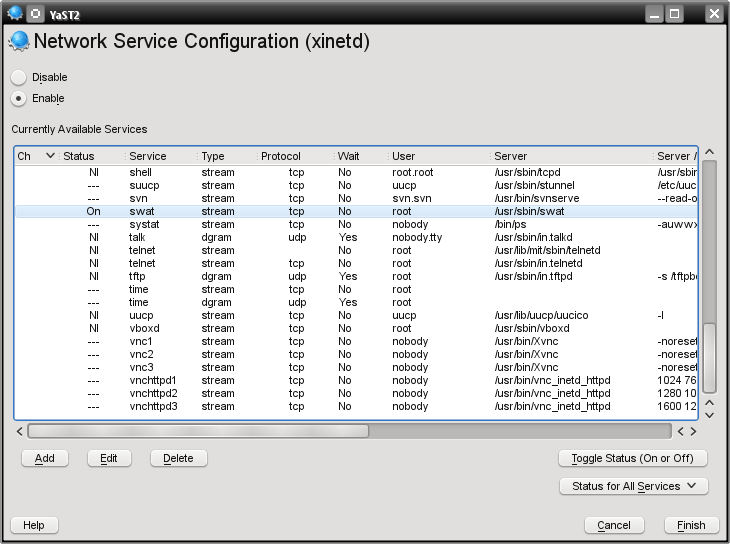 Now back in the YaST Control Center click on Network Services then Samba Server. 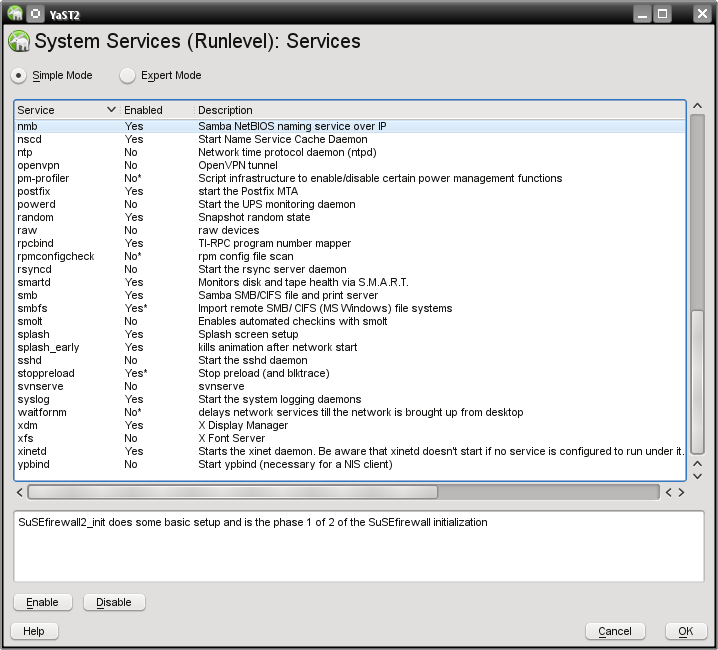 Under the Start Up tab ensure that Service Start > During Boot is checked. 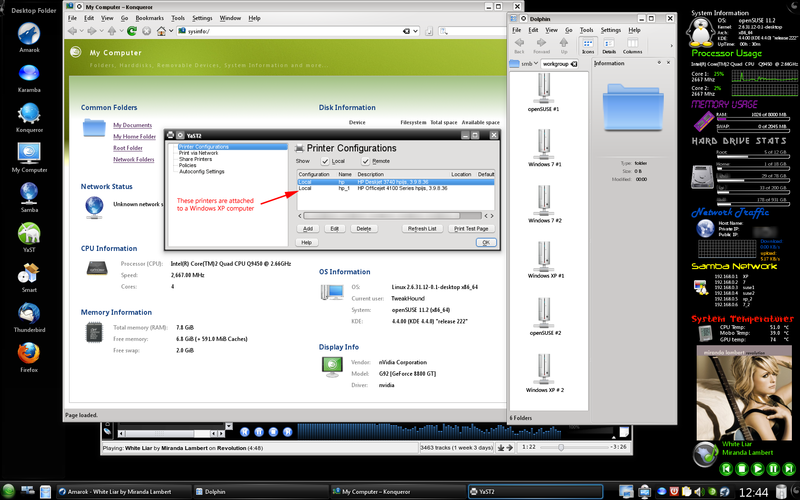 If you are using the Suse firewall also check Open Port in Firewall. Next click on the Identity tab. Fill in your Workgroup or Domain Name (the exact same name as your Windows workgroup). Next make sure the box under Domain Controller says NOT a DC. Then, in the box NetBIOS Host Name enter the name you want for your computer. Click Finish when done. Open Konqueror (or Firefox). In the address bar type localhost:901 and press the Enter key. In the resulting screen enter your root name and password and click OK.
Click on the Globals icon. Fill in the sections marked by the red paw (if they are not already filled in). Most users will not need to mess with anything else. Click the Commit Changes button when finished. Now we have to make sure we can Samba to and from your Suse box through the firewall. Open YaST. Click on Security and Users > Firewall. In the Start-Up section ensure the Start Firewall When Booting option is checked. Click on the Allowed Services tab. Under Service to Allow choose Samba Server (if it sin't already there) then click Add. 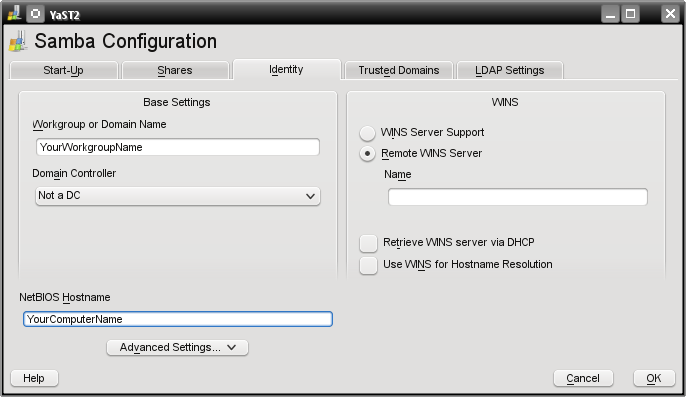 Repeat this step and add Samba Client, and Netbios Server. When finished click Next and then Accept. When finished go back to the Start-Up section and click Save Settings and Restart Firewall Now. Browsing and accessing files in both directions requires a user with Samba permissions. This user needs to already exist. You can use your account if desired (if not then it's best to add them through YaST). Open a terminal and su to root. type and then confirm password. Open Konqueror or Dolphin. Pick a folder you wish to share, right-click on it and choose Properties. Advanced sharing > and Use Samba (but do not check NFS). Then click Allowed Users. In that screen choose Allow all users to share folders. You can the choose more folders to share by clicking the Add... button. When finished click Apply to save your changes. You should now be able to share any folder by right-clicking on it (provided you have permissions on that folder). Make sure to check the appropriate boxes for your desired access settings. 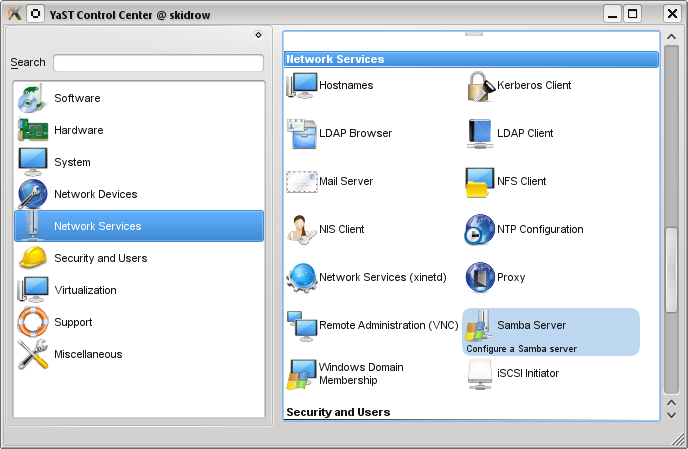 Most users will not need to go beyond this but for advanced permissions/options click More Samba Options. Now we are going to shut down every machine on the network. If you have a home server, a machine with a shared printer, or a machine that is usually on more than most then boot that one up first. Let it get fully booted up then one-by-one start the other machines on the network, letting them fully boot up before booting the next one. This method allows the network to sort of 'reset" itself. I have found that it is easiest for most folks to share printers from a Windows box to a Linux box than the other way around (there are several reasons for this beyond the scope of this guide). This is the method I'm going to show you. 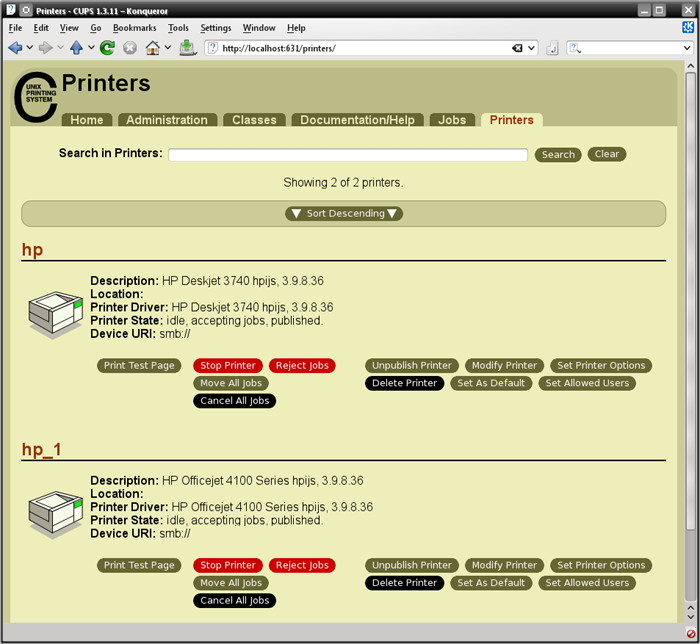 Open YaST > go to the Hardware section and click on Printer. Then click the Connection Wizard. Choose Print Via Print Server Machine > Microsoft Windows/SAMBA (SMB/CIFS). You'll will need ALL the information for the boxes below. Once you have filled in all the info click OK and in the resulting screen you will have a chance to pick the appropriate driver for your machine. 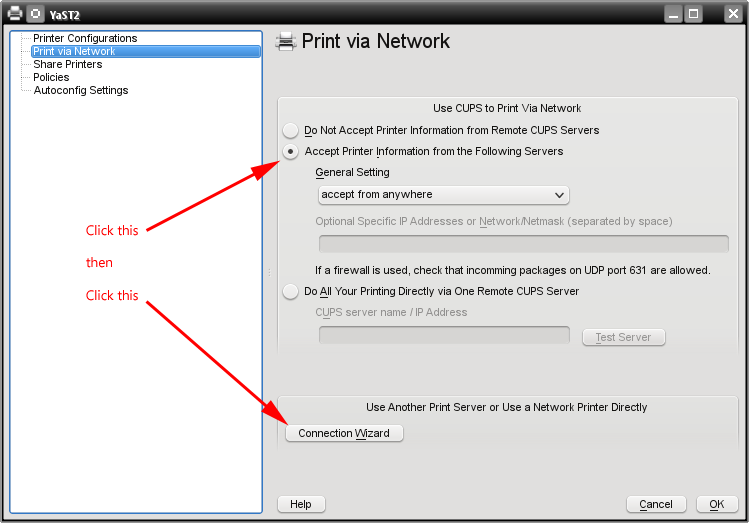 There is another option for adding, configuring, and maintaining printers. 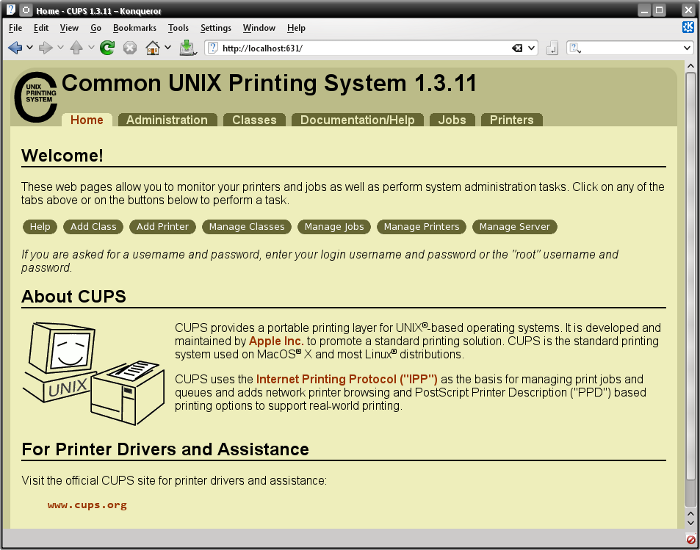 Printing is managed by CUPS and there is a management GUI. To get there open Konqueror (or Firefox) and type localhost:631 in the address bar and hit Enter. I use True Image 2011 for all my OS backups and Disk Director 11.0 for all my partitioning requirements. TweakHound readers often get a discount off Acronis Products. Check the links for more info. All material contain here is the property of the materials owner. Windows, Windows XP, Windows Vista, Windows Seven, Microsoft, and all associated logos are trademarks/property of Microsoft. You may not use or copy any material from tweakhound.com without expressed written permission. Hotlinking to any material within this site is forbidden.